Willys Jeepster was an automobile original produced by Willys-Overland Motors. The Jeepster featured many deluxe features including whitewall tires, hubcaps, sunvisors, deluxe steering wheel and wind wings. Each of our Jeepster convertible tops is manufactured to original pattern specifications and we offer the original fabric selection. 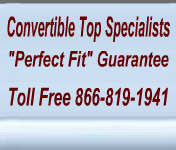 Our Jeepster convertible tops will instantly renew your vehicle to show room condition. We also have the window replacements as well as the sunvisors and boot.